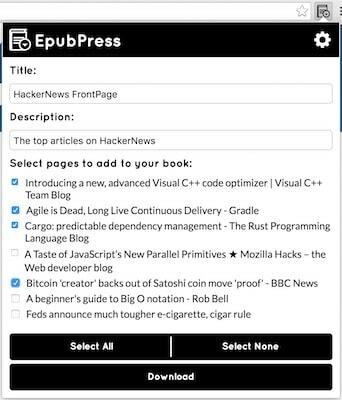 EpubPress is a browser extension for Chrome & Firefox for turning your favorite web content into ebooks. Removes ads and other distractions, for a cleaner reading experience. Makes content available offline, for reading on the go. Viewable on all your devices (Kindle, Nooks, iPhone, iPad, PC etc.). All the amazing content of the internet, available on devices that were made for reading. It can easily be installed from the Chrome Store and Firefox Add-ons. To learn about running the backend service locally, visit the haroldtreen/epub-press github repo. An extension for Safari will be available in the future! Watch the Github repo for updates. Open all of your favorite webpages in separate tabs. Arrange them in the order they should appear in the book. Select the articles to include in your book. Your selected articles will be published together and downloaded as an ebook! Describes the type of eReader file to create. .epub: Most common ebook type. Compatible with most eReaders. If you would like your book delivered by email, you can enter your address through the settings menu. Books will be delivered by **noreply@epub.press**. Some eReaders (eg. Kindle) require you to whitelist emails that can deliver to your eReader. Almost all reading apps and devices support either .mobi or .epub. If you have others that you'd like to add, let us know! Feedback is very much appreciated! The more feedback received, the better it will get. Please report any bugs/issues/problems to support@epub.press. You can also follow us on Twitter to get the latest updates on what's being developed. To follow the development of new features or get involved, visit the Extension Github Repo. To see updates to the backend service, visit the Server Github Repo. Detection of sites with lists of articles (eg. Feedly). Track and share your generated ebooks. Q: How is this different from Readability, Instapaper, Pocket, dotEpub, etc.? Allows you to combine content from all kinds of sources. No signup required. Supported through donations. Each article represented on your device as a separate book. Pages need to be sent one by one. No ability to customize ebook. Require accounts. Supported through premium pricing. Q: EpubPress was unable to find content for a page. What does that mean? Q: I tried email delivery, but my book never arrived. What's going on? Verify you entered the correct email. Try creating the book again and make sure that EpubPress returns success. If you have a lot of pages in your book, the result may be too big to email. Try removing your email and downloading instead. Q: What are the limitations of EpubPress? Books are limited to containing 50 articles. Books must be 10 Mb or less for email delivery to work. Images in an article must be 1 Mb or less. Images that exceed this limit will be removed. No more than 30 images will be downloaded. Q: Is EpubPress available for other platforms? 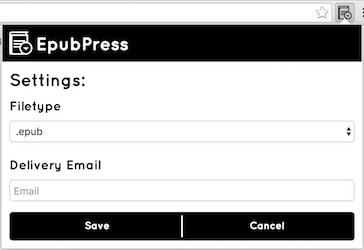 EpubPress client are planned for a variety of platforms. To see the development status of different clients, visit the Github repo. Q: How does EpubPress keep the lights on? Currently EpubPress is a free tool I've developed in my spare time. Hosting this service is paid for entirely out of my own pocket. EpubPress has no way of tracking who is creating ebooks. When a book is created, the html from your selected tabs will be sent to a server for publishing into an ebook. When an ebook is requested, your email will be sent to the server if provided. This is necessary for email delivery and will not be used for any other purposes. If no email is provided, the ebook will be returned as a file and no information about who requested the book will be saved. All extension code is available here. All backend code is available here.